Big Honey Dog Mysteries by H.Y. Hanna – Amazon Bestselling mystery books for children 9 – 12 years & dog lovers! Perfect middle-grade reading – humour, suspense & adventure! Hello and welcome to the world of Big Honey Dog Mysteries! Action-packed and full of suspense and humour, while touching on issues important to kids 9 to 12 years old, these are the perfect middle grade read or a book for parents and children to enjoy together, as well as a great choice for middle school teachers and librarians. “If you want to get your middle grade reader interested in picking up books, then this is a great place to start. ***** FIVE STARS “ ~ Net Galley. MEET THE AUTHOR – find out more about me! THE REAL HONEY – learn more about the ‘real’ Honey dog who inspired the stories. As a beagle owner the beagle in this book fits to a tee. I felt like I was reading about my boy. That is how well she described the beagle. It is really good book , anyone could read this book and fall in love with the animals in this book. Great to see an Aussie author bringing vitality into the children’s market. ‘Oh my Dog’, I knew that Honey and Hsin-Yi were winners right from the beginning and now this great book! Yay! Amazing! What a cool idea to have the dog’s show how much they love Honey’s book. Like I said, I wish I had my Honey Dog book with me when Mikey the Greyhound was sick. He would have loved the story time, and it would have been a lovely distraction having me read a story to him and of course take a picture or two of him being read to. I think he might have been sensitive with the big snake bites to his face and the huge body bloat. I hope to be in Arizona in June and will get pictures of Mikey with his book. I worry he will get boogies on it. His nose runs due to the Columbian Mesquite tress that seem to make his nose run constantly. You have a great looking group of canine and feline readers. Dogs are smart and have discerning taste when it comes to reading material. Belated thank you again for your lovely comment, Madeleine – I hope that things are going well for you and that time is healing some of the pain of losing Candy. You must be having your hands full with your new puppy! 🙂 But I’m sure it’s all good fun – hope the dogs are enjoying each other’s company. Take care! i am 30 and the owner of a great dane and i love these books! Could not put them down! keep up the great work! I have had computer problems and have not been online for what feels like forever! Thank you for posting Sheba’s picture ‘reading’ Honey’s Halloween adventure! Even though I am an adult, I still enjoy Honey’s adventures! I also look forward to reading your other books! Thank you again! Oh, you’re very welcome, Melissa! 🙂 I’m so sorry – I’ve been meaning to email you too to let you know that I’d put the picture of Sheba up but hadn’t got around to it yet. You beat me to it! 😉 And thank you for your kind words and support as always! Hi Hsin Yi, It has been a long time since I sent you a post. I was just watching a Collie dancing and it reminded me of my HOney dog. I was so impressed and proud to see all the awards you have received for your Honey Dog Mysteries. You have definitely had the writing bug. I can not believe how many books you have published to date. Such an amazing compliment. I have not been able to locate the old website with all of Honey’s videos and pictures. I have been in the mood to go down memory lane and spend time with Honey. Honey had a way of lifting my spirits. I really feel like I knew her and you. Hope you, Paul and Musili are well. Thank you, Alice, for your lovely message! How wonderful that you’re passing on your love of reading to your granddaughter. Thank you for reading my books – and recommending them to others! Missing puppies. Deadly secrets. Serious slobber. All Honey the Great Dane ever wanted was a peaceful life – walking her human, checking Peemail at the park - but when neighbourhood puppies start disappearing, life takes a sinister turn. Why are dead scarab beetles found after each disappearance? Do the strange markings on a gravestone really spell out an ancient Egyptian curse? And what about Max, the Pit Bull with a murky past, who seems to be hiding secrets of his own…can Honey risk everything and trust him or will it cost her the chance to save the puppies? * ALSO AVAILABLE FROM YOUR LOCAL LIBRARY & on order from your local bookstores. When Honey the Great Dane arrives at a dog show, the last thing she expects to meet is her doggie doppelgänger! But things get even stranger when her famous 'twin' is poisoned and Honey is asked to take her place in the show ring... She soon finds that the glamorous world of champions hides some ugly secrets. Are the Showgrounds really haunted by a Phantom Hound? What really happened ten years ago when a mysterious fire claimed two lives? And just how far will someone go to win the title of 'Best in Show'? Halloween hysteria. Christmas rescue. Easter secrets. Serious slobber. Celebrate your favourite holidays with this collection of exciting short mysteries featuring Honey the Great Dane sleuth and her canine friends. 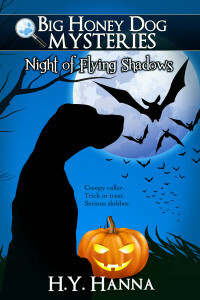 In NIGHT OF FLYING SHADOWS, a creepy visitor on Halloween night sends the dogs on a dangerous mission through a haunted forest. Then Honey and her friends find themselves deciphering a mysterious note during a snowy Christmas in MESSAGE IN A BAUBLE. Creepy caller. Trick or treat. Serious slobber. Christmas intrigue. Daring rescue. Serious slobber. 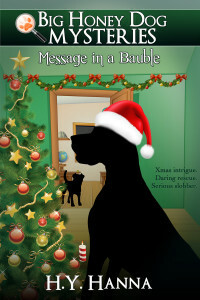 When Honey the Great Dane finds a hidden note inside a strange Christmas bauble, the festive season takes a sinister turn. Was the note from a trapped child? Join Honey and her canine friends as they set off on a daring Search & Rescue while they race to solve the mystery of the message in the bauble. Long-lost heirloom. Desperate egg hunt. Serious slobber. Join Honey the Great Dane and her canine friends in this exciting Easter mystery as they come across a strange, fairy-tale house and its mysterious occupants. 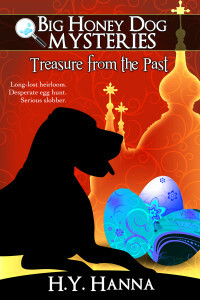 Can they decipher the clues in time to find a priceless lost treasure from the Russian Revolution? Big Honey Dog Mysteries by H.Y. Hanna | Powered by Mantra & WordPress.